Wolfgang Amadeus Mozart (baptized as Johannes Chrysostomus Wolfgangus Theophilus Mozart; January 27, 1756 – December 5, 1791) was a prolific and highly influential composer of Classical music, widely considered as one of the greatest composers in the history of that genre. His enormous output of more than six hundred compositions includes works that are widely acknowledged as pinnacles of symphonic, concertante, chamber, piano, operatic, and choral music. Mozart is among the most enduringly popular of European composers, and many of his works are part of the standard concert repertoire. Mozart was born to Leopold and Anna Maria Pertl Mozart, in the front room of nine Getreidegasse in Salzburg, the capital of the sovereign Archbishopric of Salzburg, in what is now Austria, then part of the Holy Roman Empire. His only sibling who survived beyond infancy was an older sister: Maria Anna, nicknamed Nannerl. Mozart was baptized the day after his birth at St. Rupert's Cathedral. The baptismal record gives his name in Latinized form as Joannes Chrysostomus Wolfgangus Theophilus Mozart. Of these names, the first two refer to John Chrysostom, one of the Church Fathers, and they were names not employed in everyday life, while the fourth, meaning "beloved of God", was variously translated in Mozart's lifetime as Amadeus (Latin), Gottlieb (German), and Amadé (French). 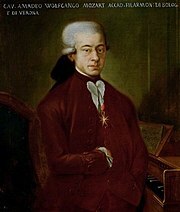 Mozart's father Leopold announced the birth of his son in a letter to the publisher Johann Jakob Lotter with the words "...the boy is called Joannes Chrysostomus, Wolfgang, Gottlieb". Mozart himself preferred the third name, and he also took a fancy to "Amadeus" over the years. (see Mozart's name). During his formative years, Mozart made several European journeys, beginning with an exhibition in 1762 at the Court of the Elector of Bavaria in Munich, then in the same year at the Imperial Court in Vienna and Prague. A long concert tour spanning three and a half years followed, taking him and his father to the courts of Munich, Mannheim, Paris, London (where Wolfgang Amadeus played with the famous Italian cellist Giovanni Battista Cirri), The Hague, again to Paris, and back home via Zürich, Donaueschingen, and Munich. During this trip Mozart met a great number of musicians and acquainted himself with the works of other great composers. A particularly important influence was Johann Christian Bach, who befriended Mozart in London in 1764–65. Bach's work is often taken to be an inspiration for Mozart's music. They again went to Vienna in late 1767 and remained there until December 1768. On this trip Mozart contracted smallpox, and his healing was considered by Leopold as a proof of God's intentions concerning the child. After one year in Salzburg, three trips to Italy followed: from December 1769 to March 1771, from August to December 1771, and from October 1772 to March 1773. Mozart was commissioned to compose three operas: "Mitridate Rè di Ponto" (1770), "Ascanio in Alba" (1771), and "Lucio Silla" (1772), all three of which were performed in Milan. During the first of these trips, Mozart met Andrea Luchesi in Venice and G.B. Martini in Bologna, and was accepted as a member of the famous Accademia Filarmonica. A highlight of the Italian journey, now an almost legendary tale, occurred when he heard Gregorio Allegri's Miserere once in performance in the Sistine Chapel then wrote it out in its entirety from memory, only returning to correct minor errors; thus producing the first illegal copy of this closely-guarded property of the Vatican. On September 23, 1777, accompanied by his mother, Mozart began a tour of Europe that included Munich, Mannheim, and Paris. In Mannheim he became acquainted with members of the Mannheim orchestra, the best in Europe at the time. He fell in love with Aloysia Weber, who later broke up the relationship with him. He was to marry her sister Constanze some four years later in Vienna. During his unsuccessful visit to Paris, his mother died 1778. On August 4, 1782, against his father's wishes, he married Constanze Weber (1763–1842; her name is also spelled "Costanze"); her father Fridolin was a half-brother of Carl Maria von Weber's father Franz Anton Weber. Although they had six children, only two survived infancy: Carl Thomas (1784–1858) and Franz Xaver Wolfgang (1791–1844; later a minor composer himself). Neither of these sons married or had children who reached adulthood. Carl did father a daughter, Constanza, who died in 1833. Mozart's final illness and death are difficult topics for scholars, obscured by romantic stories and replete with conflicting theories. Scholars disagree about the course of decline in Mozart's health – particularly at what point (or if at all) Mozart became aware of his impending death and whether this awareness influenced his final works. The romantic view holds that Mozart declined gradually and that his outlook and compositions paralleled this decline. In opposition to this, some present-day scholars point out correspondence from Mozart's final year indicating that he was in good cheer, as well as evidence that Mozart's death was sudden and a shock to his family and friends. Mozart's attributed last words: "The taste of death is upon my lips...I feel something, that is not of this earth." The actual cause of Mozart's death is also a matter of conjecture. His death record listed "hitziges Frieselfieber" ("severe miliary fever," referring to a rash that looks like millet-seeds), a description that does not suffice to identify the cause as it would be diagnosed in modern medicine. Dozens of theories have been proposed, including trichinosis, mercury poisoning, and rheumatic fever. The practice of bleeding medical patients, common at that time, is also cited as a contributing cause. Though the original grave in the St. Marx cemetery was lost, memorial gravestones (or cenotaphs) have been placed there and in the Zentralfriedhof. In 2005 new DNA testing was performed by Austria's University of Innsbruck and the US Armed Forces DNA Identification Laboratory in Rockville, Maryland, to determine if a skull in an Austrian Museum was actually his, using DNA samples from the marked graves of his grandmother and Mozart's niece. Test results were inconclusive, suggesting that none of the DNA samples were related to each other. A sheet of music from The Marriage of Figaro in Mozart's own hand. It is located at Mozarthaus in Vienna, Austria. The central traits of the classical style can all be identified in Mozart's music. Clarity, balance, and transparency are hallmarks, though a simplistic notion of the delicacy of his music obscures for us the exceptional and even demonic power of some of his finest masterpieces, such as the Piano Concerto No. 24 (Mozart) in C minor, K. 491, the Symphony No. 40 in G minor, K. 550, and the opera Don Giovanni. The famed writer on music Charles Rosen has written (in The Classical Style): "It is only through recognizing the violence and sensuality at the center of Mozart's work that we can make a start towards a comprehension of his structures and an insight into his magnificence. In a paradoxical way, Schumann's superficial characterization of the G minor Symphony can help us to see Mozart's daemon more steadily. In all of Mozart's supreme expressions of suffering and terror, there is something shockingly voluptuous." Especially during his last decade, Mozart explored chromatic harmony to a degree rare at the time. The slow introduction to the "Dissonant" Quartet, K. 465, a work that Haydn greatly admired, rapidly explodes a shallow understanding of Mozart's style as light and pleasant. From his earliest years Mozart had a gift for imitating the music he heard; since he travelled widely, he acquired a rare collection of experiences from which to create his unique compositional language. When he went to London as a child, he met J.C. Bach and heard his music; when he went to Paris, Mannheim, and Vienna, he heard the work of composers active there, as well as the spectacular Mannheim orchestra; when he went to Italy, he encountered the Italian overture and the opera buffa, both of which were to be hugely influential on his development. Both in London and Italy, the galant style was all the rage: simple, light music, with a mania for cadencing, an emphasis on tonic, dominant, and subdominant to the exclusion of other chords, symmetrical phrases, and clearly articulated structures. This style, out of which the classical style evolved, was a reaction against the complexity of late Baroque music. Some of Mozart's early symphonies are Italian overtures, with three movements running into each other; many are "homotonal" (each movement in the same key, with the slow movement in the tonic minor). Others mimic the works of J.C. Bach, and others show the simple rounded binary forms commonly being written by composers in Vienna. One of the most recognizable features of Mozart's works is a sequence of harmonies or modes that usually leads to a cadence in the dominant or tonic key. This sequence is essentially borrowed from baroque music, especially Bach. But Mozart shifted the sequence so that the cadence ended on the stronger half, i.e., the first beat of the bar. Mozart's understanding of modes such as Phrygian is evident in such passages. As Mozart matured, he began to incorporate some more features of Baroque styles into his music. For example, the Symphony No. 29 in A Major K. 201 uses a contrapuntal main theme in its first movement, and experimentation with irregular phrase lengths. Some of his quartets from 1773 have fugal finales, probably influenced by Haydn, who had just published his opus 20 set. The influence of the Sturm und Drang ("Storm and Stress") period in German literature, with its brief foreshadowing of the Romantic era to come, is evident in some of the music of both composers at that time. Over the course of his working life Mozart switched his focus from instrumental music to operas, and back again. He wrote operas in each of the styles current in Europe: opera buffa, such as The Marriage of Figaro, Don Giovanni, or Così fan tutte; opera seria, such as Idomeneo; and Singspiel, of which Die Zauberflöte is probably the most famous example by any composer. In his later operas, he developed the use of subtle changes in instrumentation, orchestration, and tone colour to express or highlight psychological or emotional states and dramatic shifts. Here his advances in opera and instrumental composing interacted. His increasingly sophisticated use of the orchestra in the symphonies and concerti served as a resource in his operatic orchestration, and his developing subtlety in using the orchestra to psychological effect in his operas was reflected in his later non-operatic compositions. Many important composers since Mozart's time have expressed profound appreciation of Mozart. Rossini averred, "He is the only musician who had as much knowledge as genius, and as much genius as knowledge." Ludwig van Beethoven's admiration for Mozart is also quite clear. Beethoven used Mozart as a model a number of times: for example, Beethoven's Piano Concerto No. 4 in G major demonstrates a debt to Mozart's Piano Concerto in C major, K. 503. A plausible story – not corroborated – regards one of Beethoven's students who looked through a pile of music in Beethoven's apartment. When the student pulled out Mozart's A major Quartet, K. 464, Beethoven exclaimed "Ah, that piece. That's Mozart saying 'here's what I could do, if only you had ears to hear!' "; Beethoven's own Piano Concerto No. 3 in C minor is an obvious tribute to Mozart's Piano Concerto No. 24 in C minor, and yet another plausible – if unconfirmed – story concerns Beethoven at a concert with his sometime-student Ferdinand Ries. As they listened to Mozart's Piano Concerto No. 24, the orchestra reached the quite unusual coda of the last movement, and Beethoven whispered to Ries: "We'll never think of anything like that!" Beethoven's Quintet for Piano and Winds is another obvious tribute to Mozart, similar to Mozart's own quintet for the same ensemble. Beethoven also paid homage to Mozart by writing sets of variations on several of his themes: for example, the two sets of variations for cello and piano on themes from Mozart's Magic Flute, and cadenzas to several of Mozart's piano concertos, most notably the Piano Concerto No. 20 K. 466. A famous story asserts that, after the only meeting between the two composers, Mozart noted that Beethoven would "give the world something to talk about." However, it is not certain that the two ever met. Tchaikovsky wrote his Mozartiana in praise of Mozart; and Mahler's final word was alleged to have been simply "Mozart". The theme of the opening movement of the Piano Sonata in A major K. 331 (itself a set of variations on that theme) was used by Max Reger for his Variations and Fugue on a Theme of Mozart, written in 1914 and among Reger's best-known works. In addition, Mozart received outstanding praise from several fellow composers including Frédéric Chopin, Franz Schubert, Peter Ilich Tchaikovsky, Robert Schumann, and many more. In the decades after Mozart's death there were several attempts to catalogue his compositions, but it was not until 1862 that Ludwig von Köchel succeeded in this enterprise. Many of his famous works are referred to by their Köchel catalogue number; for example, the Piano Concerto in A major (Piano Concerto No. 23) is often referred to simply as "K. 488" or "KV. 488". The catalogue has undergone six revisions, labeling the works from K. 1 to K. 626. Mozart is unusual among composers for being the subject of an abundance of misconceptions, partly because none of his early biographers knew him personally. They often resorted to fiction in order to produce a work. Many rumours began soon after Mozart died, but few have any basis in fact. An example is the story that Mozart composed his Requiem with the belief it was for himself. Sorting out fabrications from real events is a vexing and continuous task for Mozart scholars mainly because of the prevalence of story in scholarship. Dramatists and screenwriters, free from responsibilities of scholarship, have found excellent material among these rumours. An especially popular case is the supposed rivalry between Mozart and Antonio Salieri, and, in some versions, the tale that it was poison received from the latter that caused Mozart's death; this is the subject of Aleksandr Pushkin's play Mozart and Salieri, Nicolai Rimsky-Korsakov's opera Mozart and Salieri, and Peter Shaffer's play Amadeus. The last of these has been made into a feature-length film of the same name. Shaffer's play attracted criticism for portraying Mozart as vulgar and loutish, a characterization felt by many to be unfairly exaggerated, but in fact frequently confirmed by the composer's letters and other memorabilia. For example, Mozart wrote canons on the words "Leck mich im Arsch" ("Lick me in the arse") and "Leck mich im Arsch recht fein schön sauber" ("Lick me in the arse nice and clean") as party pieces for his friends. The Köchel numbers of these canons are 231 and 233. Milos Forman’s 1984 motion picture Amadeus, based on the play by Peter Shaffer, won eight Academy Awards and was one of the year’s most popular films. While the film did a great deal to popularize Mozart’s work with the general public, it has been criticized for its historical inaccuracies, and in particular for its portrayal of Antonio Salieri’s intrigues against Mozart, for which little historical evidence can be found. On the contrary, it is likely that Mozart and Salieri regarded each other as friends and colleagues: it is well documented, for instance, that Salieri frequently lent Mozart musical scores from the court library, that he often chose compositions by Mozart for performance at state occasions, and Salieri taught Mozart's son, Franz Xaver. The idea that he never revised his compositions, dramatized in the film, is easily exploded by even a cursory examination of the autograph manuscripts, which contain many revisions. Mozart was a studiously hard worker, and by his own admission his extensive knowledge and abilities developed out of many years' close study of the European musical tradition. In fairness, Schaffer and Forman never claimed that Amadeus was intended to be an accurate biographical portrait of Mozart. Rather, as Shaffer reveals on the DVD release of the film, the dramatic narrative was inspired by the biblical story of Cain and Abel – one brother loved by God, and the other scorned. Mozartkugel, a confectionery named in his honor. 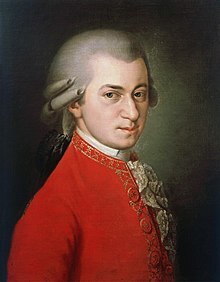 Mozart effect, a disputed theory that certain kinds of music enhance performance on certain mental tasks; the researchers who coined the term used a piece by Mozart in their first study. The Vermont Mozart Festival, an annual classical music festival named in the composer's honor; since 1974, it has performed 278 of Mozart's 626 works—possibly more than any other festival or concert series in the United States. ^ Wolfgang, in a letter to his father Leopold from June 9, 1781. In the original: "bey der thüre durch einen tritt im arsch hinaus werfen". ^ Letter from Leopold Mozart to his daughter Maria Anna from February 16, 1785. In the original: "Ich sage ihnen vor gott, als ein ehrlicher Mann, ihr Sohn ist der größte Componist, den ich von Person und den Nahmen nach kenne: er hat geschmack, und über das die größte Compositionswissenschaft." ^ Cliff Eisen, Stanley Sadie 'Wolfgang Amadeus Mozart', §6: The final years', Grove Music Online (Accessed 09 May 2006). ^ a b Luke Harding. Mozart more of a prince than a pauper. The Guardian. April 5, 2006. ^ The Mozarts first lodged in Cecil Court off Tottenham Court Road, then in Frith Street in Soho, and later in Ebury Street, where a blue plaque commemorates their stay. See BBC World Service article. ^ FAMOUS PEOPLE WITH TOURETTE'S SYNDROME AND/OR OBSESSIVE-COMPULSIVE DISORDER, SchoolBehavior.com, May 20, 2006.